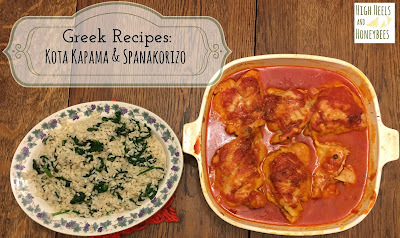 Well, I've finally worked up another post on a few of my favorite greek recipes. Everyone loves the Melomakarona recipe I posted a while back - so I thought I'd share a few more. 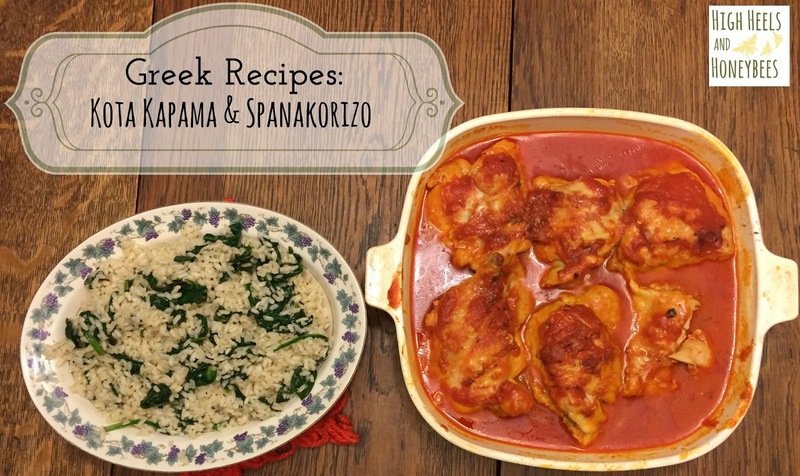 This is really two recipes - Kota Kapama (which is chicken in a red sauce) and Spanakorizo (Spinach Rice.) I've always really enjoyed both of these items together - so I thought I'd share them both on one post. First, the Kota Kapama recipe, which is a family recipe of ours. Flour chicken lightly and fry in butter. transfer fried chicken and drippings to a cooking pot and set on stove, medium heat. Add tomato sauce, lemon juice, salt and pepper, cinnamon and enough water to cover chicken. Simmer (on low) for 45 mins to 1 hour. The Spanakorizo recipe is from How to Roast a Lamb - but modified by somethings I remember (and my dad remembers) about the family recipe - like the addition of dill. Cook the rice as you normally do - but I use chicken stock instead of water. While the rice is cooking, warm olive oil in large skillet on medium-high heat. Will scallions for 2-3 minutes. Add spinach and stir in salt, pepper and lemon juice. Stir till it is wilted evenly. When the rice is done, add it to the spinach mixture and stir in butter and season with dill. A side note - if you make these two recipes together - sauté the spinach in the same pan you fry the chicken and you can omit the olive oil step. The chicken is a recipe that both my kids enjoy - which is great because our doctor says that we need to get the kids to eat the same food that we do. So I mark these recipes up as a success. I'd love to hear any feedback! Enjoy!